Tourism in Bangladesh is a slowly developing foreign currency earner. The country has much to attract international and domestic tourists. In the northern part, comprising the Rajshahi division, there are archaeological sites, including the temple city Puthia in Rajshahi; the largest and most ancient archaeological site, Mahasthangarh in Bogra; the single largest Buddhist monastery, Paharpur in Naogaon; the most ornamental terracota Hindu temple in Bangladesh Kantaji Temple, and many rajbaris or palaces of old zamindars. In the north-eastern part, Sylhet division, there is a green carpet of tea plants on small hillocks. Natural reserved forests are great attractions. Migratory birds in winter, particularly in the haor areas, are also very attractive in this area. Pohela Boishakh: Bangla New Year [Bangla: বাংলা নববর্ষ Bangla Nôbobôrsho] or Pohela/Poyela Boishakh [পহেলা বৈশাখ Pôhela Boishakh or পয়লা বৈশাখ Pôhela Boishakh] marks the first day of the Bangla Calendar. Poyela Boishakh is celebrated with great fervor in the South Asian region of Bengal.In Bangladesh, it is a national holiday celebrated around 14 April.Pohela Boishakh is a Public festival [সার্বজনীন উৎসব] of the Bengalis; it is celebrated among all Bengalis- irrespective of religious and regional differences. Language Movement Day, commemorate protests and sacrifices to protect Bangla as a national language. Correspondingly, February 21 is a national holiday in Bangladesh. Ekushey Book Fair, Fair that take place throughout the February month. Cox’s Bazar, Miles of golden sands, towering cliffs, surfing waves, rare conch shells, colorful pagodas, Buddhist temples and tribes, delightful seafood—this is Cox’s Bazar, the tourist capital of Bangladesh, Having the world’s longest (120 kilometers.) beach sloping gently down to the blue waters of the Bay of Bengal, Cox’s Bazar is one of the popular tourist spots in the country. With a beach that is one of the contenders for the world’s longest (120 kilometers), sloping gently down to the blue waters of the Bay of Bengal. In the east lie the hilly and forested regions of Tripura, Myanmar. There are other tourist places and destinations in Bangladesh, like Srimangal, Mainamati, Mahasthangarh, Paharpur, Rangamati, and Kaptai for sight seeing, and the Sundarbans. Cox’s Bazar and its adjoin areas have a lot of things to see and places deserve visit by the tourists: Himchari, Inani, Maheskhali, Ramu, SonadiaIsland, The Aggameda Khyang. Kuakata, Kuakata is one of the rarest places which has the unique beauty of offering the full view of the rising and setting of crimson sun in the water of the Bay of Bengal in a calm environment. That perhaps makes Kuakata one of the world’s unique beaches. It is 70 km from Patuakhali district headquarters and 320 km from Dhaka. Sundarbans, The Sundarbans delta, at the mouth of the Ganges river, is the largest mangrove forest in the world, spreading across parts of Bangladesh and West Bengal, India. The Sundarbans features a complex network of tidal waterways, mudflats and small islands of salt-tolerant mangrove forests. The area is known for its wide range of fauna, with the Royal Bengal tiger being the most famous, but also including many birds, spotted deer, crocodiles and snakes. St. Martin’s Island, This small coral island about 10 km (6 mi) south-west of the southern tip of the mainland is a tropical cliché, with beaches fringed with coconut palms and bountiful marine life. Nafa-khum largest water fall of the country. Nijhum Dwip Nijhum Dweep located in the Bay of Bengal under the jurisdiction of the Noakhali District of Bangladesh, was designated in 2001 as the NijhumDweepNational Park. The park is rich in plant and animal life, as well as being home to plentiful bird-life, while hosting numerous migratory birds. Shrine of Hazrat Shah Jalal(Rh) Hazrat Shah Jalal was buried in Sylhet.The Shrine of Hazrat Shah Jalal has become a place of pilgrimage for hundreds of devotees who come to the shrine in their droves from all over the country. Not far from the Shrine of Hazrat Shah Jalal, is the Shrine of Hazrat Shah Paran, who is believed to be Hazrat Shah Jalal’s nephew. Mosque City of Bagerhat, The Mosque City of Bagerhat is a formerly lost city, located in the suburbs of Bagerhat city in Bagerhat District, in the Khulna Division .The historic city, listed by Forbes as one of the 15 lost cities of the world, has more than 50 Islamic monuments. Kantojiu Temple, built between 1702 and 1752, a nava-ratna (nine-spired) style hindu temple. Dhakeshwari Temple, built in 12th century, a hindu temple. Hoseni Dalan, a Shia shrine built in the 17th century. Somapura Mahavihara,Somapura Mahavira (Great Monastery) is a Buddhist monastery situated in the Rajshahi District in the north of Bangladesh.Covering almost 27 acres of land, Somapura Mahavira is one of the largest monasteries south of the Himalayas. The design is considered to be greatly influenced by Buddhist architecture found in Java and Cambodia. Mainamati Mainamati an isolated ridge of low hills in the eastern margins of deltaic Bangladesh, about 8 km to the west of Comilla town is a very familiar name in BAngladesh’s cultural heritage. A landmark of our ancient history, it represents a small mass of quasi-lateritic old alluvium.The ridge, set in the vast expanse of the fertile lower Meghna basin, extends for about 17 km north-south from Mainamati village on the Gumti River to Chandi Mura near the Lalmai railway station. The oldest archaeological site in Bangladesh is outside Bogra, at Mahasthangarh. Sonargaon,Sonargaon (Bengali: সোনারগাঁও; also transcribed as Sunārgāon) was the administrative center of medieval Muslim rulers in East Bengal. Lalbagh Fort Lalbagh Fort or FortAurangabad, an incomplete Mughal palace fortress at Dhaka on the river Buriganga in the southwestern part of the old city.The fort was considered to be a combination of three buildings (the mosque, the tomb of Bibi Pari and the Diwan-i-Aam), two gateways and a portion of the partly damaged fortification wall. Ahsan Manzil, Ahsan Manzil was previously the official palace of the Dhaka Nawab family and is currently a museum preserving the culture and history of the area.Ahsan Manzil is considered to be one of the most noteworthy architectural monuments in Bangladesh. Bara Katra, Bara Katra an architectural relic of Dhaka city. It is situated to the south of Chawk Bazar close to the bank of the river buriganga.The Katra enclosed a quadrangular courtyard with 22 rooms on all of its four sides. Tourism is also defined as a set of activities of a person traveling to a place out side his or her usual environment for less than a year and whose purpose of travel is other than the exercise of an activity renumerated from the place visited. According to leiper’s model, tourism can be thought of as a wide range of individuals’, businesses, organizations and places that combine in some way to the deliver a travel experience. Tourism is defined as the activities of persons travelling to and staying in places outside their usual environment for not more than one consecutive year for leisure, business and other purposes not related to the exercise of an activity remunerated from within the place visited. Leisure however is from a Latin word “Licere” which means “to be permitted” or “to be free”. The French word “Loisir” means “Free time”, and the English words “License” and “Liberty”. George Tokildsen (1992) also defines leisure as freedom from constraint, opportunity to choose time left over work or other free time after obligatory social duties have been met. Leisure is defined as free time spent doing what a person enjoys when not working or studying. Parker (1976) sees leisure as encompassing of activities that are characterized by feeling of cooperative freedom. Tourism is a complex trade covering all movements of people outside their own community for all purposes except migration or regular daily work. The growth of tourism and leisure to a large industry has led to tourism becoming increasingly sophisticated. Therefore there is need for investment of both private and public sectors in the economy. Tourism and leisure is completely dependent on government and its agencies, to provide infrastructure, like roads, airports, facilities and incentives for growth and development. The public sector is that part of economic and administrative life that deals with the delivery of goods and services by and for the government, whether national, regional or local/municipal. The government of Uganda is committed to developing the economic, social and cultural sectors of Uganda. The government took over many abandoned or formerly expropriated companies in 1986 and formed new parastatal enterprises. In an effort to bring development, the government has attracted foreign assistance and is rebuilding the economic and social infrastructure. The public sector in tourism is concerned with national benefits presented through politics, which can embrace economic factors like balance of payments and employment. Tourism is subject to direct and indirect government intervention primarily because of its employment and income producing possibilities. There have been increasing demands from conservative national governments and economic rationalists for greater Industry self-sufficiency in tourism marketing and promotion. (Jeffries 1989). Tourism has become an integral part of the machinery of many modern governments, and of many government programmes in both developed and lesser-developed countries. (Lea 1988, Pearce 1992, Richter1989). Tourism and leisure are an essential part of the economic development strategies of the local state. The development of urban corporations and enterprises rejuvenates the growth of inner city leisure spaces, festival market places, casino’s, conference centres, sports stadia, botanical gardens and golf courses. These developments attract tourists and new investments, thus promoting themselves as attractive places to live, work, invest and play (Tourism and public policy-colin Micheal Hall and John M. Jenkins). Government is the focus of demands articulated through a variety of structures and channels including significant individuals, institutions, and the media (Tourism and public policy- Collin Michael Hall). Diagram of the public administration.This diagram shows the elements of public administration and their relations to each other. These sectors of Administration are responsible for supervising operations, putting them into practice (e.g. taxation and employment), and responsibility at the operational level (e.g. education, health care). Uganda is competing on the World market and to penetrate this market it is necessary to offer good quality products at a competitive price but most of all to offer unique products with a Ugandan approach. It is, however, not enough just to have the right product; Government must support the tourism sector, provide security and provide a conducive environment. The government, in its leadership role, has always been known to spearhead and pioneer tourism development, by laying the infrastructural foundation, providing the legislative, physical, fiscal, social and environmental framework. Regulating, facilitating, policy making, definition and formulation of policy, implementation, coordination, evaluation and planning in development, promotion and sustainability of tourism and Leisure. The Ugandan government has traditionally done this through several measures. The Government of Uganda through the implementation of policies like the Poverty Eradication Action Plan (PEAP) has developed leisure and tourism. Through guiding the formulation of government policy, the public sector is eradicating poor health and limited education. In 1992 nearly 56 percent of Ugandans were below the poverty line, there was wide spread poaching in National parks and low levels of skilled labour. By 1996 this figure had fallen to 46 percent. The sharpest fall was in the central and western regions, while the eastern and northern regions experienced more modest declines in poverty. (Uganda Human Development report 2005) DanieL Kalinaki a reporter of the Monitor Newspaper said that the absolute number of people living in absolute poverty reduced marginally, from 9.3 million to 9 million over the period of 1992 to 2003. Government through the Ministry of finance and Economic development is using organizations like Uganda community Tourism association (UCOTA) to involve the local community in tourism development and increasing household incomes. The theme for this year’s budget (2006/2007) is ‘Enhancing Economic Growth and Households Incomes through Increased Production and Productivity’ as read by Minister of Finance, planning and Economic Development Dr. Ezra Suruma. People earn income through entertainment like Ndeere troupe, markets, community campsites and crafts like the craft village, therefore increasing the involvement of local communities in tourism related activities, Selective training is encouraged for local communities in business development and in partnership development with UWA, UFA and other organisations. (Poverty Eradication Action Plan-2004/5-2007/8) These government organisations conserve and sustainably manage the wildlife and protected areas of Uganda in partnership with neighborhood communities and other stakeholders for the benefit of the people of Uganda and the global community, which enhances tourism and leisure development. Bangladesh is a low-lying, riverine country located in South Asia with a largely marshy jungle coastline of 710 km (441 mi) on the northern littoral of the Bay of Bengal. Formed by a delta plain at the confluence of the Ganges (Padma), Brahmaputra (Jamuna), and Meghna Rivers and their tributaries, Bangladesh’s alluvial soil is highly fertile, but vulnerable to flood and drought. Hills rise above the plain only in the Chittagong Hill Tracts in the far southeast and the Sylhet division in the northeast. Straddling the Tropic of Cancer, Bangladesh has a tropical monsoon climate characterized by heavy seasonal rainfall, high temperatures, and high humidity. Natural disasters, such as floods, tornadoes, and tidal bores affect the country yearly. Bangladesh also is affected by major cyclones, on average 16 times a decade. A cyclone struck the southeastern coast in May 1991, killing 136,000 people. Cyclone Sidr struck the southwestern coast on November 15, 2007, affecting not only the coastal districts of the administrative division Khulna but also about half of the tropical forest Sundarbans. The physical geography of Bangladesh is varied and has an area characterized by two distinctive features: a broad deltaic plain subject to frequent flooding, and a small hilly region crossed by swiftly flowing rivers.The country has an area of 147,570 square kilometers and extends 820 kilometers north to south and 600 kilometers east to west. Bangladesh is bordered on the west, north, and east by a 4,095-kilometer land frontier with India and, in the southeast, by a short land and water frontier (193 km) with Burma (Myanmar). On the south is a highly irregular deltaic coastline of about 580 kilometers, fissured by many rivers and streams flowing into the Bay of Bengal. The territorial waters of Bangladesh extend 12 nautical miles (22 km), and the exclusive economic zone of the country is 200 nautical miles (370 km). 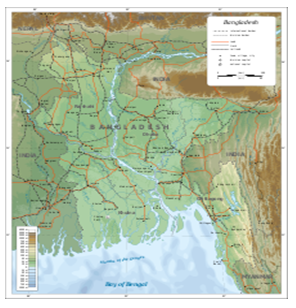 Roughly 80% of the landmass is made up of fertile alluvial lowland called the Bangladesh Plain. The plain is part of the larger Plain of Bengal, which is sometimes called the Lower Gangetic Plain. Although altitudes up to 105 meters above sea level occur in the northern part of the plain, most elevations are less than 10 meters above sea level; elevations decrease in the coastal south, where the terrain is generally at sea level. With such low elevations and numerous rivers, water—and concomitant flooding—is a predominant physical feature. About 10,000 square kilometers of the total area of Bangladesh is covered with water, and larger areas are routinely flooded during the monsoon season. Bangladesh has a tropical monsoon climate characterized by wide seasonal variations in rainfall, high temperatures, and high humidity. Regional climatic differences in this flat country are minor. Three seasons are generally recognized: a hot, muggy summer from March to June; a hot, humid and rainy monsoon season from June to November; and a warm-hot, dry winter from December to February. In general, maximum summer temperatures range between 38 and 41 °C (100.4 and 105.8 °F). April is the hottest month in most parts of the country. January is the coolest month, when the average temperature for most of the country is 16–20 °C (61–68 °F) during the day and around 10 °C (50 °F) at night. . Winds are mostly from the north and northwest in the winter, blowing gently at 1 to 3 kilometers per hour (0.6 to 1.9 mph) in northern and central areas and 3 to 6 kilometers per hour (1.9 to 3.7 mph) near the coast. From March to May, violent thunderstorms, called northwesters by local English speakers, produce winds of up to 60 kilometers per hour (37.3 mph). During the intense storms of the early summer and late monsoon season, southerly winds of more than 160 kilometers per hour (99.4 mph) cause waves to crest as high as 6 meters (19.7 ft) in the Bay of Bengal, which brings disastrous flooding to coastal areas. Heavy rainfall is characteristic of Bangladesh causing it to flood every year. With the exception of the relatively dry western region of Rajshahi, where the annual rainfall is about 1,600 mm (63.0 in), most parts of the country receive at least 2,300 mm (90.6 in) of rainfall per year. Because of its location just south of the foothills of the Himalayas, where monsoon winds turn west and northwest, the region of Sylhet in northeastern Bangladesh receives the greatest average precipitation. From 1977 to 1986, annual rainfall in that region ranged between 3,280 and 4,780 mm (129.1 and 188.2 in) per year. Average daily humidity ranged from March lows of between 55 and 81% to July highs of between 94 and 100%, based on readings taken at selected stations nationwide in 1986. About 80% of Bangladesh’s rain falls during the monsoon season. The monsoons result from the contrasts between low and high air pressure areas that result from differential heating of land and water. During the hot months of April and May hot air rises over the Indian subcontinent, creating low-pressure areas into which rush cooler, moisture-bearing winds from the Indian Ocean. This is the southwest monsoon, commencing in June and usually lasting through September. Dividing against the Indian landmass, the monsoon flows in two branches, one of which strikes western India. The other travels up the Bay of Bengal and over eastern India and Bangladesh, crossing the plain to the north and northeast before being turned to the west and northwest by the foothills of the Himalayas. Natural calamities, such as floods, tropical cyclones, tornadoes, and tidal bores—destructive waves or floods caused by flood tides rushing up estuaries—ravage the country, particularly the coastal belt, almost every year. Between 1947 and 1988, 13 severe cyclones hit Bangladesh, causing enormous loss of life and property. In May 1985, for example, a severe cyclonic storm packing 154-kilometre-per-hour (95.7 mph) winds and waves 4 meters (13.1 ft) high swept into southeastern and southern Bangladesh, killing more than 11,000 persons, damaging more than 94,000 houses, killing some 135,000 head of livestock, and damaging nearly 400 kilometers (248.5 mi) of critically needed embankments. Annual monsoon flooding results in the loss of human life, damage to property and communication systems, and a shortage of drinking water, which leads to the spread of disease. For example, in 1988 two-thirds of Bangladesh’s 64 districts experienced extensive flood damage in the wake of unusually heavy rains that flooded the river systems. Millions were left homeless and without potable water. Half of Dhaka, including the runway at the ShahjalalInternationalAirport—an important transit point for disaster relief supplies—was flooded. About 2,000,000 tonnes (2,204,623 short tons; 1,968,413 long tons) of crops were reported destroyed, and relief work was rendered even more challenging than usual because the flood made transportation of any kind exceedingly difficult. A tornado in April 1989 killed more than 600 people, possibly many more. There are no precautions against cyclones and tidal bores except giving advance warning and providing safe public buildings where people may take shelter. Adequate infrastructure and air transport facilities that would ease the sufferings of the affected people had not been established by the late 1980s. Efforts by the government under the Third Five-Year Plan (1985–90) were directed toward accurate and timely forecast capability through agrometeorology, marine meteorology, oceanography, hydrometeorology, and seismology. Necessary expert services, equipment, and training facilities were expected to be developed under the United Nations Development Programme. 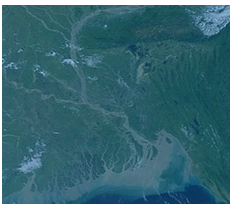 The rivers of Bangladesh mark both the physiography of the nation and the life of the people. About 700 in number, these rivers generally flow south. The larger rivers serve as the main source of water for cultivation and as the principal arteries of commercial transportation. Rivers also provide fish, an important source of protein. Flooding of the rivers during the monsoon season causes enormous hardship and hinders development, but fresh deposits of rich silt replenish the fertile but overworked soil. The rivers also drain excess monsoon rainfall into the Bay of Bengal. Thus, the great river system is at the same time the country’s principal resource and its greatest hazard. The profusion of rivers can be divided into five major networks. The Jamuna-Brahmaputra is 292 kilometers long and extends from northern Bangladesh to its confluence with the Padma. Originating as the Yarlung Tsangpo River in China’s Xizang Autonomous Region (Tibet) and flowing through India’s state of Arunachal Pradesh, where it becomes known as the Brahmaputra (“Son of Brahma”), it receives waters from five major tributaries that total some 740 kilometers in length. At the point where the Brahmaputra meets the TistaRiver in Bangladesh, it becomes known as the Jamuna. 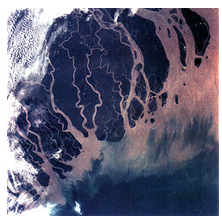 The Jamuna is notorious for its shifting subchannels and for the formation of fertile silt islands (chars). No permanent settlements can exist along its banks. The second system is the Padma-Ganges, which is divided into two sections: a 258-kilometer segment, the Ganges, which extends from the western border with India to its confluence with the Jamuna some 72 kilometers west of Dhaka, and a 126-kilometer segment, the Padma, which runs from the Ganges-Jamuna confluence to where it joins the MeghnaRiver at Chandpur. The Padma-Ganges is the central part of a deltaic river system with hundreds of rivers and streams—some 2,100 kilometers in length—flowing generally east or west into the Padma. A fifth river system, unconnected to the other four, is the Karnaphuli. Flowing through the region of Chittagong and the Chittagong Hills, it cuts across the hills and runs rapidly downhill to the west and southwest and then to the sea. The Feni, Karnaphuli, Sangu, and Matamuhari—an aggregate of some 420 kilometers—are the main rivers in the region. The port of Chittagong is situated on the banks of the Karnaphuli. The Karnaphuli Reservoir and Karnaphuli Dam are located in this area. The dam impounds the KarnaphuliRiver’s waters in the reservoir for the generation of hydroelectric power. During the annual monsoon period, the rivers of Bangladesh flow at about 140,000 cubic meters per second, but during the dry period they diminish to 7,000 cubic meters per second. Because water is so vital to agriculture, more than 60% of the net arable land, some 91,000 km², is cultivated in the rainy season despite the possibility of severe flooding, and nearly 40% of the land is cultivated during the dry winter months. Water resources development has responded to this “dual water regime” by providing flood protection, drainage to prevent overflooding and waterlogging, and irrigation facilities for the expansion of winter cultivation. Major water control projects have been developed by the national government to provide irrigation, flood control, drainage facilities, aids to river navigation and road construction, and hydroelectric power. In addition, thousands of tube wells and electric pumps are used for local irrigation. Despite severe resource constraints, the government of Bangladesh has made it a policy to try to bring additional areas under irrigation without salinity intrusion. Positive image of our tourism industry must be expressed by our diplomats, ambassadors, consular representing Bangladesh in different countries of the world. Bangladeshi representatives abroad can act as overseas office for the wholesale tour operators who conduct inbound tours. Billboard, leaflets, brochure, magazines and other promotional materials can be displayed in different places in home and abroad. Local people have to be informed about the attractions rich in history, culture, and heritage. Different beaches, rivers and other wetlands have to be converted with various establishment activities like river cruise, boating, beach volleyball, waterskiing, fishing, etc. along with boatel based food and accommodation specially in Sundarbans area. There is lack of security and safety on travels and in the parks and tourists destinations in Bangladesh. Therefore, the adequate safety and security of the tourists should be ensured to remove negative image. Full-fledged tourism training institutes have to be established in a good number in different region so that they could produce skilled professionals to satisfy the needs and demand of the tourist. Adventure tourism like trekking, hiking, mountaineering, hunting in different hilly areas must be established by building up different clubs and organizations. To build more eco-park, safari park and wildlife sanctuary especially in Sundarbans, Hill tracts and different potential areas like Dula Hazra and Madhabkunda. Tourism facilities and services like accommodation, food and beverage, entertainments, travel agents, tour operations, shopping malls, supermarkets, transporters have to be established in good number in international standard in different tourist areas by public and private sectors. Unexplored area like Parkirchar, Cheradip, Sandeed, and Hatia must be taken into consideration to explored properly and established all tourist facilities there for the sake of the development of tourism. Ecological balance must be maintained by preserving forests, wildlife flora and fauna. It is also to be ensured that illegal fishing, hunting, smuggling trees and animal bodies must be prohibited in those areas. The present legal formalities to come in Bangladesh for the foreigners are strict and rigid. Therefore, the existing formalities are to be made easy so that, the foreigners get interests to visit in Bangladesh. Tourist fair can be arranged in an adequate number in home and abroad to inform the latest updates of our tourism products, services and overall tourism industry to attract the tourist. Government can formulate long term and short term master plan for the overall tourism development by growing interest to the investors and commercial organizations. The largest portion of tourists visiting Bangladesh uses airways only international airport, Dhaka. Expansion in also needed for tourist charters not only in Dhaka but also in Chittagong, Sylhet, Barisal, Rajshahi, Comilla and Dinajpur. Tourism in educational curriculum is to be initiated; subjects should be introduced in the High School level. Bangladesh Parjatan Corporation, Bangladesh Biman and Civil Aviation Authority should be working in partnership for the overall development of tourism in Bangladesh and also for promoting tourism abroad as per their areas of operation. Tourism Call Centers may be introduced like ‘MedicalCallCenters’ and ‘LegalCallCenters’ to keep potential tourists informed about the tourism products, facilities and services available in all over Bangladesh. The study found that major portion of tourist come in Bangladesh for other purposes than tourism purpose, so to attract tourists to visit Bangladesh through marketing of its tourists attractions, effective promotion, recreation and entertainment should be organized. 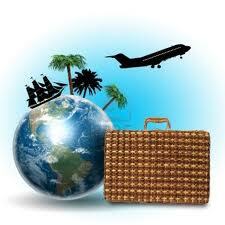 Both the foreign and the private sectors’ investment are quite insufficient in tourism. This paper suggests taking necessary policies to attract these investments. NGOs should support community based tourism initiatives to form associations and collectively assess the markets; provide legal assistance; advice on community based resource management programs; gender awareness training; assistance with administrative arrangements; scientific assistance in feasibility studies using participatory and action research methods; improve the links between groups. NGOs should build up their capacity as facilitators and trainers of participatory processes, tourism planning and as social entrepreneurs within the tourist industry. NGOs at all levels should effectively participate in sharing with all stakeholders experience and knowledge about successful strategies, obstacles and how to overcome them. At present world tourism industry appeared as competitive and promising sector. It is not only that tourism sector earns foreign currency but also that tourism creates image of the country and cultural diversification. The country, having tourism potential, must be conscious in developing market offering and marketing mix. Bangladesh has sheer lacking in this regard which need to be overcome through proper marketing planning. Natural, ecological, historical, cultural and other form of tourism based tourism industry of Bangladesh has huge potentials to develop due to its kind. The country has its potential to differentiate its product for its uniqueness. Therefore, tourism industry of Bangladesh must arrange its marketing mix elements such a way that give its better satisfaction to its customers. Tourism market should be segmented on the basis of income level not only for foreigners but also domestic tourists. On the other hand upper class people of the country who tours abroad can be inspired to tour within the income group and lower income group of people of the country, tourism facility should be created within their purchasing power capability. As tourism is mostly service oriented business professional people is very much essential here. Bangladesh Parjatan Corporation, though, offers short term and vocational courses but highly educated and well known persons are very essential. Recently University of Dhaka and some other private universities opened. creation of good image of the country. If all these measures, marketing strategies along with policy measures are coordinated, tourism sector in Bangladesh would yield a positive result. 3.Kazi Wahidul Alam. (2002). “Bangladesh Tourism and the Dhaka Travel Mart: 2002.